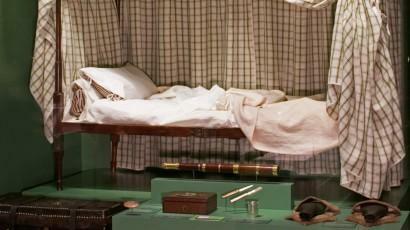 Mount Vernon is blessed with a large collection of George Washington and Mount Vernon related artifacts. Learn more about ten of the most remarkable items in our extensive Mount Vernon collection. In 1785, French sculptor Jean-Antoine Houdon accepted a commission from the Virginia State legislature to create a life-size marble statue of George Washington for the state capitol. 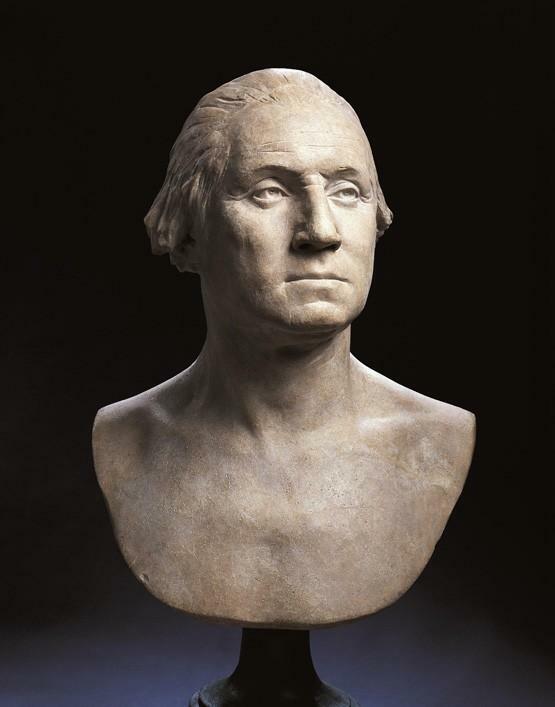 During his two-week stay at Mount Vernon that October, Houdon sculpted this bust from locally dug clay and possibly fired it in the kitchen bake oven. Houdon left the bust with Washington and took with him a life mask and detailed physical measurements to complete the final sculpture in France. Washington placed the bust over one of the doors in his study, where it remained until it was removed for conservation reasons. Considered to be the most accurate likeness of George Washington, the bust has remained at Mount Vernon since its creation, one of the few original objects transferred to the Mount Vernon Ladies' Association when the fledgling organization came into possession of the estate in 1860. Conservation courtesy of the Life Guard Society of Mount Vernon and the Guild of Professional Tour Guides of Washington D. C.
George Washington's campaign furniture, like that of his English officer counterparts, provided some of the comforts of home while in the field of war, and also attested to his rank and distinction. In October 1775, shortly after assuming command of the Continental Army, he acquired "a Field Bedstead & Curtains, Mattresses, Blankets etc. etc." Designed for portability and durability, this bedstead's tapering posts, turned legs, and rails are ingeniously hinged so it can be folded into a compact bundle for easy transport. The headboard, tester, lathe, and one leg are later replacements. 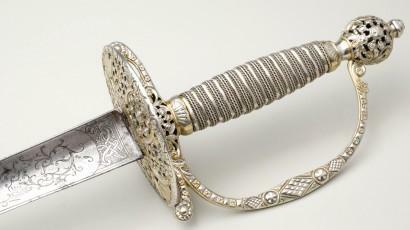 Eighteenth-century gentlemen wore small swords as part of formal civilian attire for social and ceremonial occasions. George Washington owned several of these jewel-like, lightweight weapons. This particular one, with an ornately engraved colichemarde (a three-sided hollow blade), is distinguished by being depicted in Charles Willson Peale's 1772 portrait of Washington as a Virginia colonel. Washington is also believed to have worn this sword when he resigned his commission as commander in chief in Annapolis in 1783 and when inaugurated as our nation's first president on April 30, 1789. 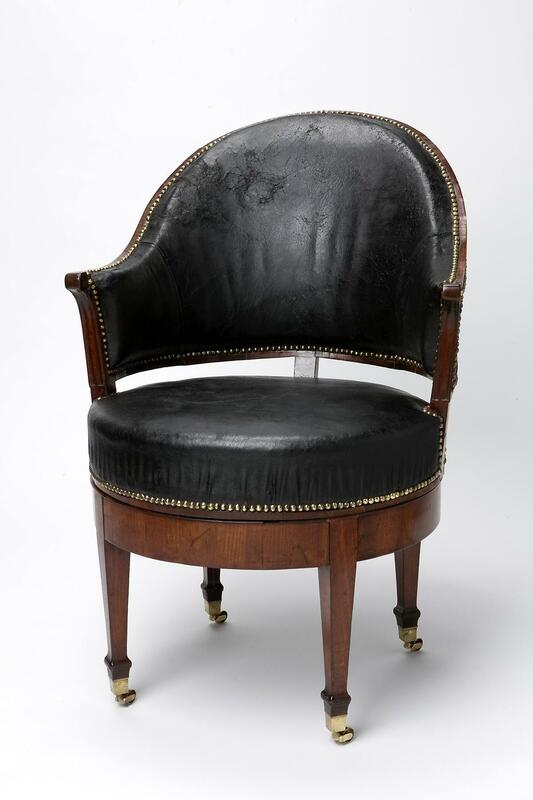 In 1766, Martha Washington acquired from London upholsterer Philip Bell the materials needed to create "one dozn. Chair bottoms." Over the next thirty-six years, she carefully cross-stitched a scallop-shell design that she herself possibly created. While she may have intended for the canvases to upholster slip seats, they were ultimately fabricated into cushions that were likely placed on Windsor chairs in the Little Parlor at Mount Vernon. 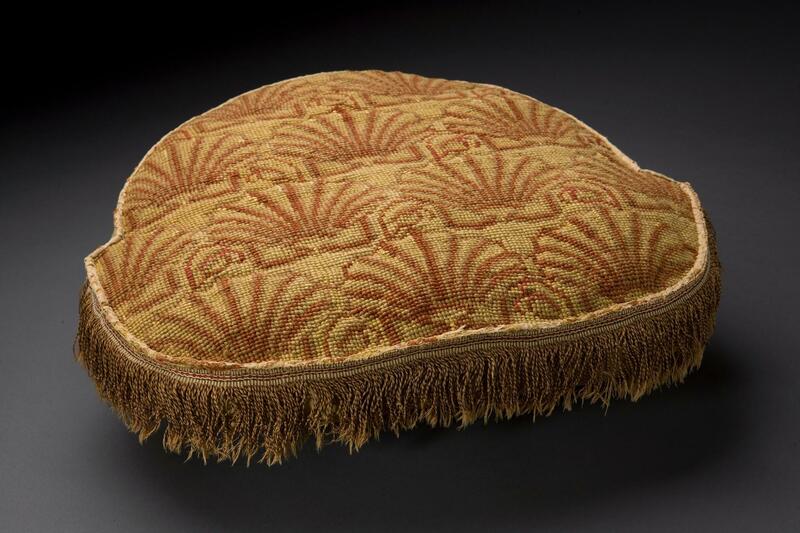 This cushion is one of six in Mount Vernon's collection. Its yellow worsted wool casing and portions of the multicolor, hand-knotted fringe and woven silk tape remain intact, making it a rare documented example of Martha Washington's needlework and original upholstery at Mount Vernon. The Washingtons relied on skilled slaves as well as white overseers and servants to ensure that Mount Vernon ran with efficiency. 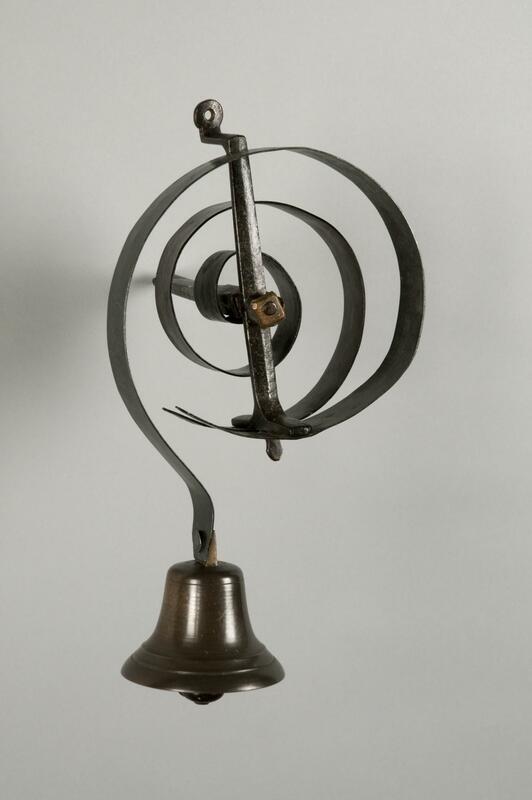 This bell was one of several that formed the original house bell system at Mount Vernon, used to call slaves or servants to specific locations within the Mansion. When the south porch was removed from the Mansion in 1935, this was one of three bells and a crank that was taken down. "Give me leave, my dear General to present you with a picture of the Bastille, just as it looked a few days after I had ordered its demolition—with the main key of the fortress of despotism. It is a tribute, which I owe, as a son to my adoptive father, as an Aide-de-Camp to my General, as a Missionary of liberty to its Patriarch." The storming of the Bastille by a Parisian mob on July 14, 1789, marked the beginning of the French Revolution. As commander of the Paris National Guard in 1789, the Marquis de Lafayette received the keys to the loathsome political prison, a symbol of absolute monarchy. In 1790, he sent this key and a drawing of the prison in ruins to George Washington, his former commander, who was in New York City, serving his first term as America's first president. 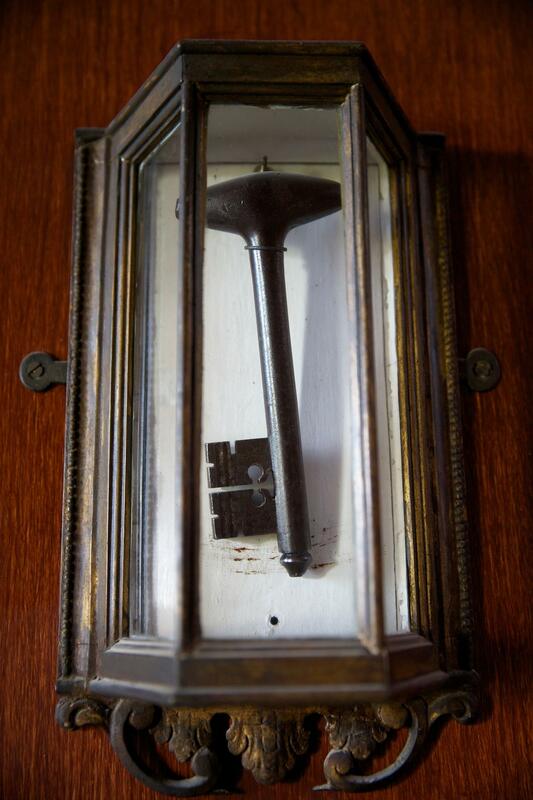 Washington prominently displayed the key as a "token of victory by Liberty over Despotism," installing it in a custom-made, carved and gilded case in his Philadelphia executive residence and then in the central passage at Mount Vernon, where the key and case remain to this day. On April 17, 1790, Washington paid New York cabinetmaker Thomas Burling £7 for this ingeniously-engineered "Uncommon Chair." It combines the sleek, contemporary design of a French bergère en gondole (or barrel-back upholstered armchair) with a unique swivel mechanism that allows the circular seat to rotate on four bone rollers. Washington must have found the chair to be ergonomically pleasing, as he used it throughout his presidency and for the remainder of his life. Following his return to Mount Vernon in March 1797, he placed it in his study along with the tambour secretary he acquired from Philadelphia cabinetmaker John Aitken. 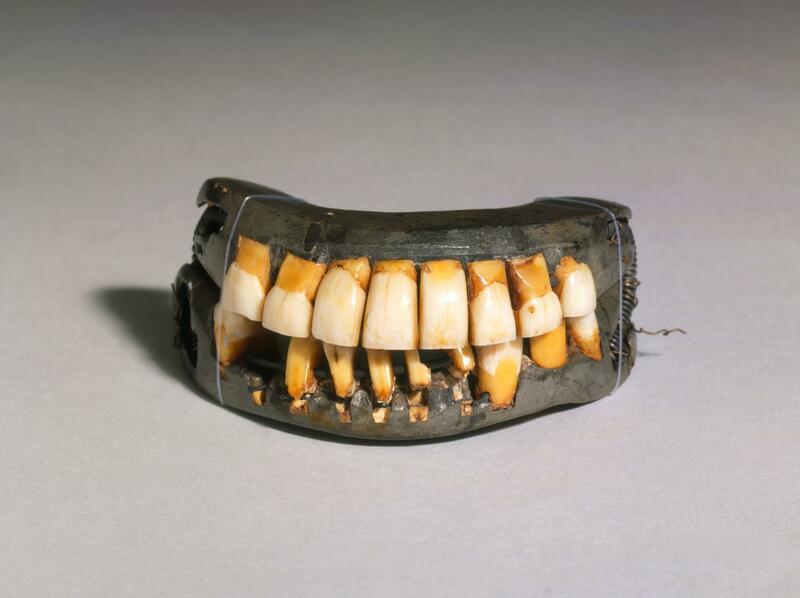 George Washington experienced problems with his teeth throughout his adult life. Although he regularly used dental powders and a toothbrush similar to our own, his tooth loss persisted. By the time he took the oath of office as president at age 57, he had only one natural tooth remaining and owned multiple sets of dentures. Contrary to popular myth, his false teeth were not made of wood but of human, cow, and horse teeth as well as elephant and walrus ivory. The dentures required frequent adjusting to function naturally, and he repeatedly sent them to John Greenwood, his dentist in New York City, for repairs. For a person as conscious of his appearance as Washington, his dental dilemma caused great discomfort. On April 24, 1796, Dutch merchant Andreas Everardus van Braam Houckgeest arrived in Philadelphia from Canton with "A Box of China for Lady Washington." Van Braam designed the porcelain's decoration, which features Martha Washington's initials surrounded by the names of all the states in a linked chain. A blue snake biting its own tail encircles the rim of the dishes. 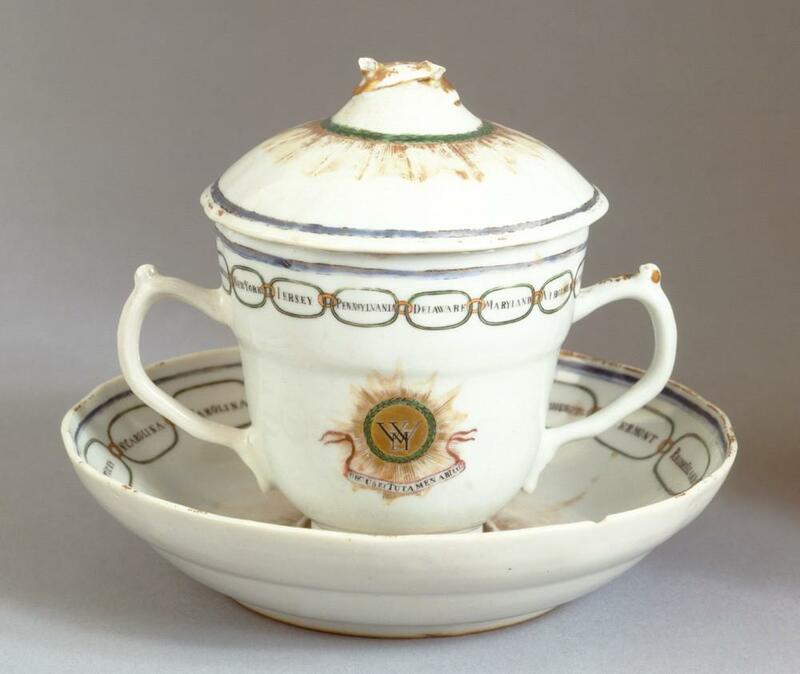 Martha Washington's will refers to Van Braam's gift as "tea china." However, two-handled covered cups such as this were used in Europe for serving chocolate and caudle, a warm spiced drink of wine or ale. Chocolate was served for breakfast at Mount Vernon, and Mrs. Washington perhaps occasionally used Van Braam's so-called "States china" to serve this exotic drink. British-trained architect Benjamin Henry Latrobe painted this charming scene of the Washingtons at ease on the piazza at Mount Vernon following his visit there in 1796. George and Martha Washington are shown seated at a tea table bearing a large hot water urn. 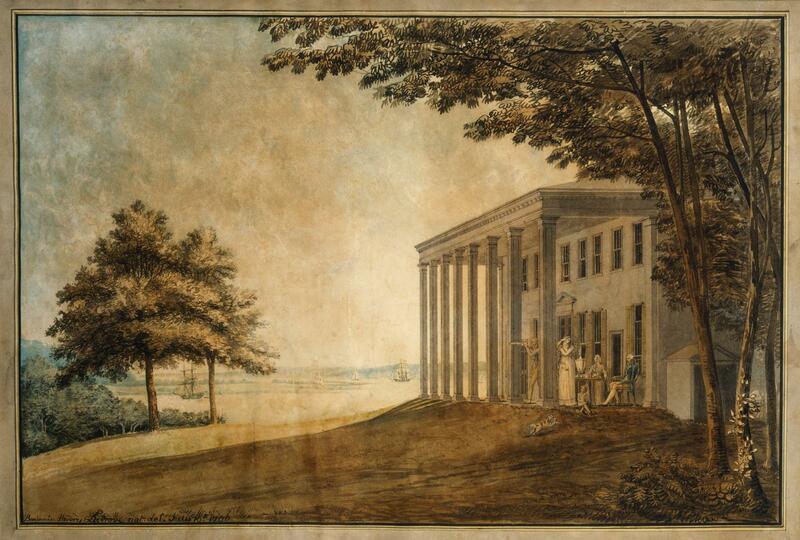 They are accompanied by granddaughter Eleanor (Nelly) Parke Custis, wearing a fashionable Grecian gown, and an unidentified young man with a spyglass who may be Latrobe himself. Nelly's dog, Frisk, plays on the lawn with a child, possibly belonging to Washington's aide, Tobias Lear. There are many romanticized depictions of the Washingtons at Mount Vernon, but only two were created during George Washington's lifetime and only Latrobe's appears to have been drawn from life (Latrobe's signature on this piece is accompanied by the phrase "nat. del.," meaning drawn from nature).